What a wonderful weekend at this year’s Braderie! 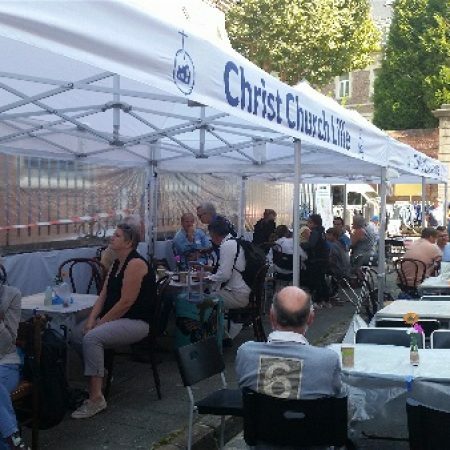 It must have been all those prayers, beautiful weather, great teamwork, tweaked prices and hard work at the ovens which all contributed to making this such a successful event. The new awnings gave a very smart, professional appearance and were no doubt a crowd puller. At the end of the Braderie on Sunday evening we put out the old tents and they were taken by a couple who work in Lille for an association supporting sick children. They were thrilled to have them and send many thanks. Whilst the lady was waiting for her husband to arrive with the car to take them away, she and I were talking outside church while the evening service was taking place, she had tears running down her face at ‘the beautiful voices singing to God’. I was blessed to have many conversations over the weekend with returning guests to our tea rooms. Updates and experiences shared over tea and cake with friends I see just once a year. Some have been coming for 30 years (you know who you are my friends from Dover! ), some get off the coach from Wales and come straight to us for a proper cup of tea, some from Holland, Belgium, the UK, elsewhere in France and Lille itself, all are welcome and I loved seeing you all again. God has indeed blessed us and it was also the most successful Braderie event for us financially, ever. We raised 4,612.95€ (of which 263.07€ came from use of the toilets) for ministry, mission and outreach at Christ Church. I have just written individually to 45 people to thank them for their help, so many people being ready to join in, including people who have only just arrived at Christ Church. I have a growing list of things to think about for next year, so if you have some suggestions or ideas, please let me know. We pray that God will bless us over the months and years ahead.